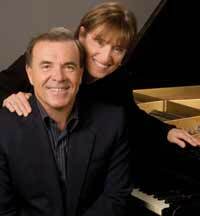 The healing power of music will take center stage this week with the debut of a unique resource guide to the valley's mental health care services presented at a concert by international superstar pianists Misha and Cipa Dichter to raise money for suicide prevention. From the helplessness felt by the survivors of a young man named Dex Gannon, who ended his life on a hillside overlooking his home town in 2010, there grew an urgency to prevent similar tragedies and to reduce the isolation of those left behind. Dex's father, Steve Gannon, learned under fire who to turn to with his grief. It was by chance that he saw a letter written to the Express reminding the public of the Wood River chapter of the National Alliance on Mental Illness' services, which led to the first step of healing—information. Once empowered, Gannon, who with fiancé Susan Spelius Dunning heads the Sun Valley Artist Series, decided to use their music to elevate awareness. At first, the idea was to dedicate a concert's proceeds to benefit Wood River NAMI, the Crisis Hotline and The Speedy Foundation—created in memory of Boise Olympic silver-medalist skier, Jared "Speedy" Peterson. They settled on a March 10 piano concert by valley favorites, the Dichters. "We didn't hesitate for a moment because we feel so close to Steve and Susan and are devastated by their loss," they said in an email. "Having sons of course adds to our deep emotions. We hope to continue to learn ever more about the cause." Gannon and Dunning felt there needed to be more communicated about the services in the valley and set about putting together that guide. In a forward to the guide, Gannon explained, "Since his death I have tried to find ways to give meaning to Dex's loss, and possibly to spare others the bottomless grief such loss can bring." Attendees at Saturday's concert will get the first glimpse at, and a copy of, "Get Help," a comprehensive booklet specific to the valley and its resources offering mental health care treatment, definitions and support. It was created by the Sun Valley Artist Series and sponsored by St. Luke's Wood River. At the concert, there will be a gathering in the lobby of organizations that contribute to suicide prevention and mental health, including the Advocates for Survivors of Domestic Violence and Sexual Assault, Crisis Hotline, St. Luke's Center for Community Health, National Alliance on Mental Illness, The Sun Club, Lee Pesky Learning Center, and Hospice and Palliative Care of the Wood River Valley. An informative pre-concert lecture on suicide prevention and related mental-health issues will feature talks and video presentations given by prominent health care professionals, St. Luke's hospital staff and others. Then the Dichters will appear on two 9-foot Steinway concert grand pianos featuring incomparable music, including works by Franz Liszt and Samuel Barber. The Dichters perform regularly at many leading summer festivals, including Aspen, Mostly Mozart, Ravinia, the Hollywood Bowl, Caramoor and the Mann Center. Following a concert by the Dichters at New York's Mostly Mozart Festival, The New York Times declared, "One was struck not only by the synchronism of their musical impulses, but also by the vigor and elegance of the execution." When: Saturday, March 10, at 6 p.m.
Tickets: $100 at Ketchum bookstores and on the web at www.svartistseries.org. Price includes a tax-deductible donation. $250 patron tickets, and a link for those unable to attend the concert but who would like to contribute to the cause.